In 12-inch skillet, cook beef, onion, poblano chiles and garlic over medium-high heat 5 to 7 minutes, stirring occasionally, until beef is thoroughly cooked; drain. Spray 5-quart round slow cooker with cooking spray. Reserve 1/2 cup of the enchilada sauce. Spoon 1/2 cup enchilada sauce in slow cooker. Stir remaining enchilada sauce into beef mixture. Place 1 tortilla in center of slow cooker. Cut 1 tortilla in half; place each half on either side of whole tortilla. Spoon 1 1/3 cups beef mixture over tortillas; sprinkle with 1/2 cup cheese. Top with 2 more tortillas, cutting to fit. 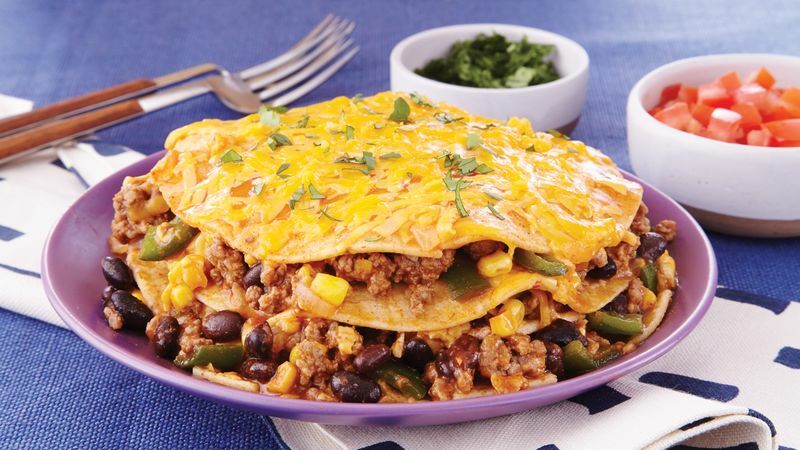 Repeat layers 3 times with beef mixture, tortillas and 1 1/2 cups cheese. Top with 1/2 cup enchilada sauce and 1 cup cheese. Cover; cook on Low heat setting 2 hours. Let stand 15 minutes. Garnish with cilantro.